Java 8 providing java.time.LocalDateTime class. By using plusSeconds() method of LocalDateTime we can add seconds to date. By Using minusSeconds() method we can substract seconds from java date. Lets see an example java program to add n seconds to current date and minus / subtract n seconds from java 8 date. #1: Java Example program to add n seconds to current date using java 8. 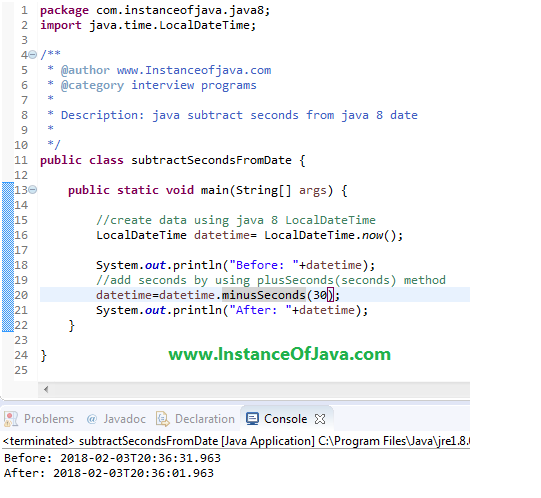 #2: Java Example program to subtract n seconds to current date using java 8.